Ontario’s biodiversity is at risk, threatening our economy and quality of life, and the Liberal government is missing in action. 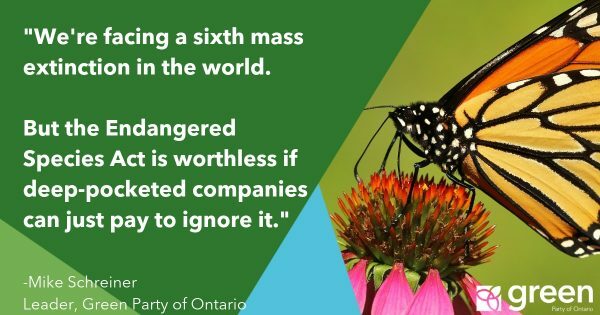 The Green Party of Ontario is urging action to ensure that Ontario develops a biodiversity strategy that protects our economy and natural heritage. Clean and inexpensive drinking water is critical to our quality of life. Diverse wetlands are the most efficient method of recycling this water. The loss of wetlands reduces nature’s efficient and low cost natural systems to provide clean water. This means more of our already stretched tax dollars are spent on water filtration and cleaning systems. Biodiversity directly affects some of our most important economic sectors: forestry, food and farming, fisheries, and tourism. The Environment Commissioner of Ontario’s (ECO) special report today revealed that Ontario’s maple trees face possible extinction in the next decade from the Asian Longhorn beetle. This will decimate our maple syrup industry. Loss of pollinators threatens our food and agriculture sector, the second largest employer in the province. Invasive species such as Asian Carp threaten our Great Lakes fishery. Climate change presents risks to spruce tree growth, which would wipe out our forestry sector. The ECO’s special report reveals that Ontario does not have a biodiversity strategy and will likely fail to meet our international biodiversity commitments. The government has failed to deliver solutions. 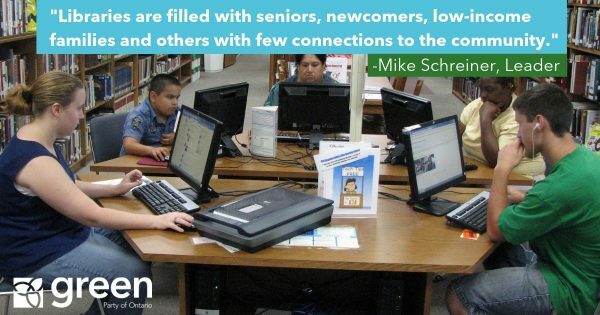 Our children deserve a good quality of life. Diverse ecosystems provide essential services such as clean water and healthy food. The GPO supports a biodiversity strategy that protects our natural heritage while enriching our quality of life and our economy.